Her Words Echo Through The Ages . . . The program begins at 6PM and runs for 30 to 45 minutes. 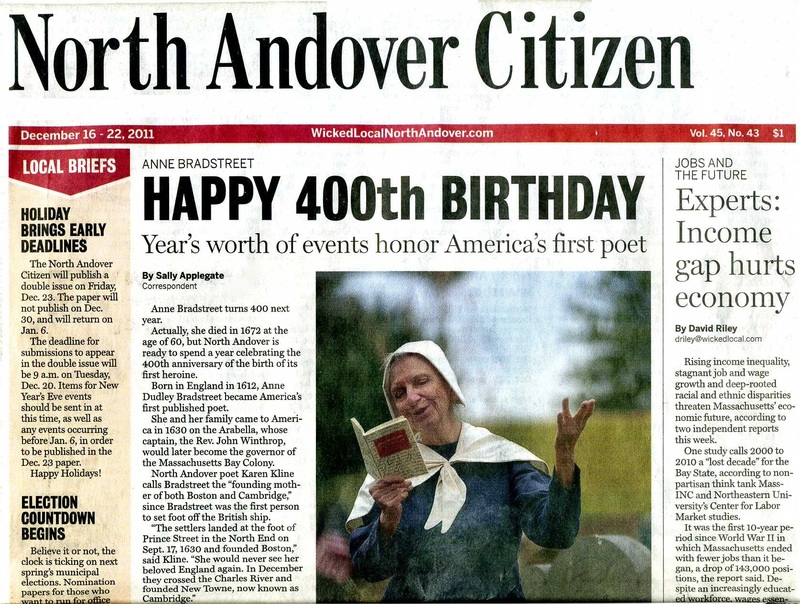 NORTH ANDOVER – Anne Bradstreet lived, wrote and died in North Andover, but the only memorial to her is a marker in the town’s Old Burying Ground. Local poet Karen M. Kline hopes to gain attention for Bradstreet, referred to as America’s first published poet, by building a brick walkway and dedicating it to the poet. The walkway would run from the Old Burying Ground down Academy Road to the Old Center. “Right now, until she has a place of honor somewhere in this town where she lived and died, I’m on a poetic path to honor the original poet laureate in our town,” said Kline, who plans to talk about her idea at an upcoming selectmen’s meeting. Kline said the walkway also would be a safety measure because many students walk on Academy Road from the middle school to the youth center in the Old Center. Bradstreet came to America from England in 1630 and lived in Cambridge and Ipswich before coming to North Andover, then known as Andover Parish, in 1645. She resided here in the Valley of the Poets until her death in 1672. One book of her poetry, “The Tenth Muse Lately Sprung up in America,” was published in London without her knowledge when her brother-in-law traveled to England in 1650. A second edition, with her corrections, was published in Boston in 1678 after her death. 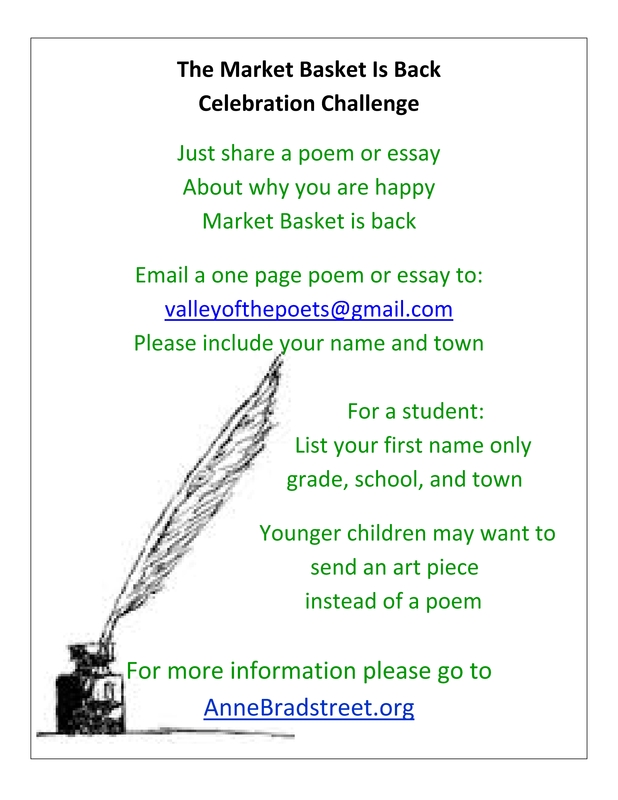 Bradstreet scholars said it is about time something is created to honor the poet. “She is not unheralded, but she is relatively obscure. 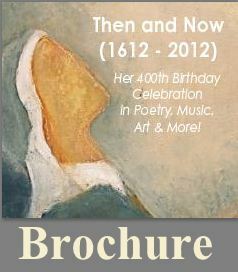 More people have heard of Emily Dickinson,” said Jeannine Hensley of Hanover, who edited an edition of Bradstreet’s poems in 1967. Hensley said that although Bradstreet is becoming more popular in high schools and colleges, it is rare to find any physical reminders of her life here. The house where she lived in Cambridge before she came to North Andover no longer exists and the house where she spent most of her time in North Andover burned down six years before her death. There is a Bradstreet Gate in Harvard Yard named in her honor in 1997. A bronze plaque marks the site of her home in Ipswich where she lived with her husband who went on to become governor of Massachusetts. One other surviving artifact is a manuscript of poetry and other writings in her own handwriting that is owned by the trustees of Stevens Memorial Library, but rarely displayed, it is so fragile. 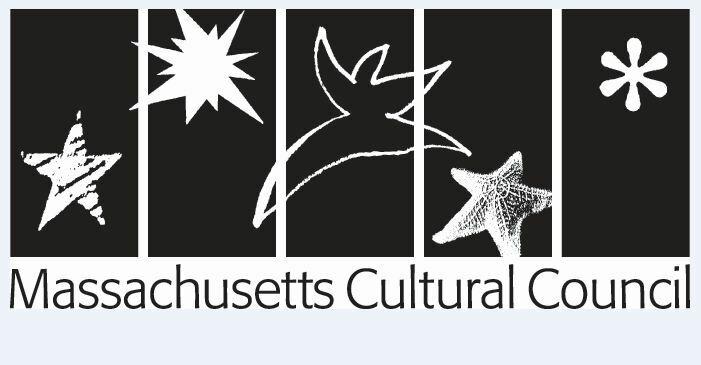 “I had gone all through high school, college and graduate school and I never encountered one line of her work,” Nancy Weare of Exeter, N.H., who put together a small book of selections of Bradstreet’s poems in 1998 after hearing about Bradstreet during an event at Stevens Memorial Library. Anne Bradstreet; Selections from Her Works, edited by Nancy V. Weare, is available at the library.